I watched a baby bird clinging to a branch. Just one bird, scared and out of its nest. Her mama waited on the ground. 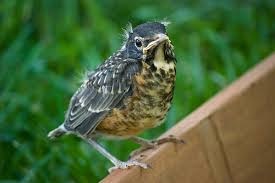 If that baby bird could hop back up into her nest a couple of branches above, I think she would have. Her mama was saying something, over and over again. I think I heard, “Come on. You’re ready. You can do it. I’m right here for you. I believe in you. Nothing will harm you. Its safe. Your wings are strong. You can fly.” That baby bird looked at me peering in on her. I think I could have reached into that tree and held her. She looked paralyzed. By fear. Of the big, big, unknown world. The world beneath her and the world above her. I’ve never been a mama bird gathering vigorously the sticks, strings, and pieces of other materials worthy enough to create a nest. In hopes of nurturing new life in that homemade nest. I think I can relate though. I have gathered up experiences, moments, hard times and happy times, meaningful words to create something for others to read. I have built the words into sentences, paragraphs, then sat down. Rearranged it, often in the middle of the night. Read it over and over again. Left it alone. Wondered if it would help others, or if it might hurt others. Wondered if anyone would care. Hoped that someone would. Even just one person. I let my baby bird go this week. I paced around. I got so scared. Maybe she wasn’t ready. Or maybe I just wasn’t ready to let her go. What if people hurt her, shamed her, threw stones at her? Or even worse, what if people ignored her? I panicked. I would never know everybody that came in contact with her. Maybe, hopefully, others would let me know, “I saw your baby bird flying. The wind was strong. She was stronger. She just flew and flew and flew. You would have been so proud. She couldn’t have been more ready to leave your nest.” My baby bird was a piece of writing that represented an unashamed, braver, less fearful, more honest me. I hoped that if I gently pushed her out of the nest, that she would fly and that I would feel like I helped set her free. That’s all I could hope for. All I could do. I couldn’t create something really small, a baby bird that possessed hope, youth, fearlessness, strength and the ability to fly and then force her to stay in my nest. No matter how many hours her nest took to make, it was not meant to be her home forever. Thousands have seen my baby bird. And I can’t begin to know all of them. See their faces when they met her. Many have written to tell me that she empowered them, educated them, and impacted them. Just a tiny little baby bird of mine. I feel proud. I feel uncertain. I feel a little naked. Who knew my baby bird held such power beneath her new wings? Not me. I guess we can never know where the things we create will go if we never give them the opportunity to leave the nest. Fly away. Thank you all for encouraging and cheering on my baby bird. Thank you for sending me postcards to let me know that she is beautiful. And strong. And filled with hope. You have turned this strange, empty, anxious feeling into the feeling I could imagine a mama bird possesses when she watches her baby bird soaring.